Culture is representative of the values, beliefs and assumptions that guide the collective behavior of employees within a company. It is not defined by the words that a company chooses to showcase on a wall somewhere. Culture is not only the attributes that can be seen by the world such as jeans versus suits or beer kegs and ping-pong tables, it is also the way things are done around the office when we think no one is looking. It is unconscious, taken-for-granted beliefs and assumptions of each team member within an organization. Whether or not you are intentional, deliberate and consistent about building and engaging your culture – it exists – and is impacting your business performance. When we think about culture at ICC, and measuring culture, we think beyond employee happiness, flashy perks and extravagant office surroundings. Companies who have chosen to participate in Best Companies to Work for in Colorado are looking to get intentional about building a Best Company to Work for culture. 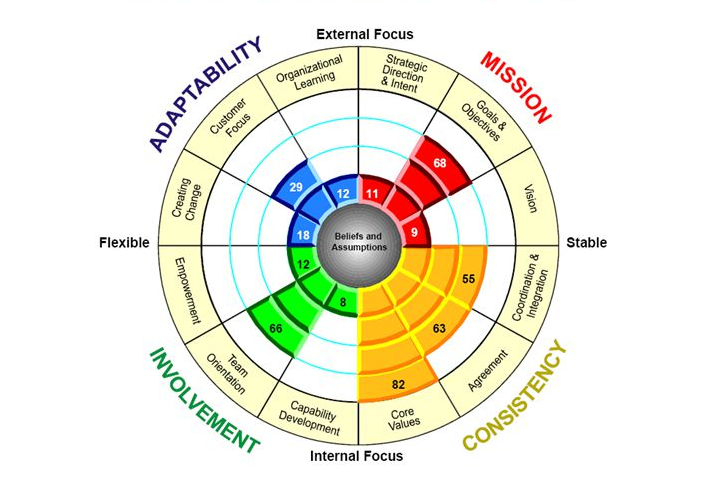 Using the Denison Assessment, we examine four basic traits that link to organization performance —mission, adaptability, involvement, and consistency—and the performance metrics include such things as profitability, sales growth, quality, innovation, and market value. As demonstrated in this study of 130 firms, it proves the link between culture and organizational performance. 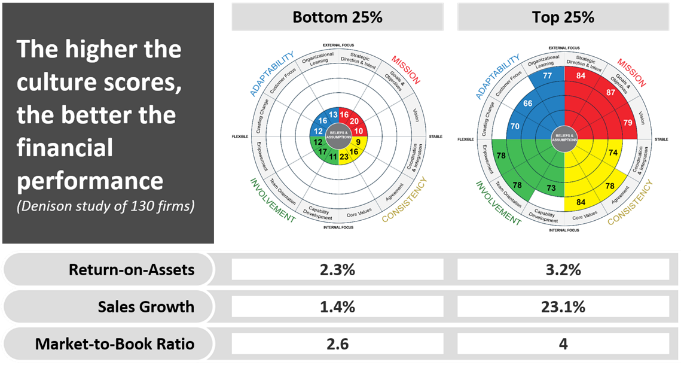 The circumplex on the right shows financially strong companies and the ones on the left demonstrate companies who lack clarity and alignment and are financially weaker. This is not just a survey or collection of items, this is an organized, informative, intuitive model that allows one to discern patterns, not just individual scores. A clear understanding of organizational culture is important for all leaders because it influences the way that their organizations react to the changing demands of the business environment. At any given time, the culture of an organization is strongly influenced by the past successes and learnings about how to adapt and survive. As the business environment changes, leaders must constantly anticipate the necessary changes and actively monitor the relationship between the demands of the environment and the capabilities of the organization. When there is a “gap” between the capabilities of the organization and the demands of the business environment, most successful organizational changes require changes in the mindset, values and behavior of the employees. Without creating these changes, changes in basic capabilities of the organization are impossible. That is why many organizations are discovering that successful change requires careful attention the values and beliefs that are the “heart of the company”, the policies and practices that put those values into action, and the importance of teaching the members of the organization an understanding of how they create value for their customers. Culture Fit: How Important Is It, Really?